So, the Romans did it. When rich Romans died, Pliny the Elder records, they had themselves made in wax. Not their whole selves, you understand- the cost would be extortionate – but their hands and their face. And their relatives would get their favourite frock or toga and dress them up, and parade them in their funeral procession. And afterwards, when all the food was eaten and all the guests had gone home, the effigies would be put in their own little cupboard in the family atrium so that any time you wanted, you could access a 3D representation of what your loved one looked like. In the Atrium, where the fires burned, the effigies were wont to get a little smokey. Cicero writes that the oldest and most noble families were marked out by the smokiest effigies. The wishes of the dead are often recorded; but not always the reasons why. And so we will never know why a 50-year-old aristocrat from East Anglia made such an unusual request. Sarah Hare was sitting there one Sunday in 1744, sewing, as was her habit. Of course, sewing on a Sunday was frowned upon; she pricked her finger, and got an infection, and died of it, and all the locals said that was her punishment. And it would have ended there, had Sarah not been a fairly wealthy lady. Best not ignore the wishes of the dead, and they didn’t; they obeyed her edicts to the letter. And so if you go to the little village of Stow Bardolph, in the far reaches of East Anglia, and look in the mahogany cupboard at the back of the church, there she is. As large as life and twice as scary, for she was quite the battleaxe if her appearance is anything to go by. The effigy includes her prominent wart. She is dressed in her own clothes and bewigged in her own hair. 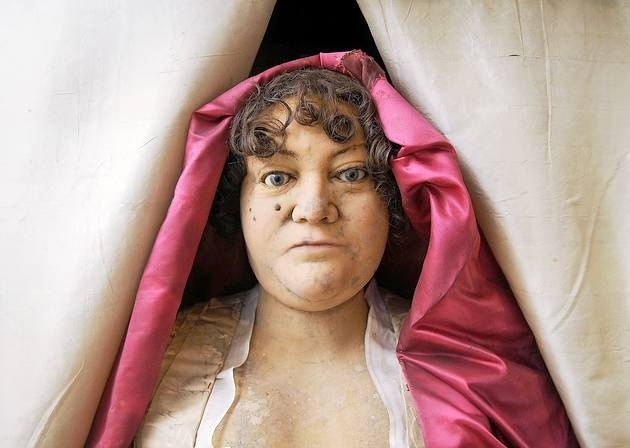 She got old and tatty in 1984, and someone from Madame Tussaud’s came up and took her away for a two-year restoration. Tastes have changed, and smokey ancestors are no longer de rigeur. Did she read her Pliny and Cicero? Did she want to emulate King Charles , whose effigy stood in Westminster for a good long while? Or was she just an eccentric old bat who would have delighted in terrifying little children for more than two centuries? I and the family jump into the car today and travel to stay for a week in Sarah Hare’s neck of the woods. East Anglia: where stories like this one come two a penny. Posted in Places to visitTagged Death, East Anglia, Romans, sarah hare, Stow Bardolph, wax effigiesBookmark the permalink. Trying to be immortal, I imagine. She probably would have gone for cryogenics if it had been around at the time. Waxing lyrical again, Kate. I was at school with the young Tussaud and, as I remember, he was about as animate as Sarah Hare is now. 😀 It’s in the genes, Roger. Great story. What a wonderful way to haunt our ancestors forever. I know! Call Mme Tussaud’s right away! More adventures for the Shrewsdays! Hope you enjoy several shivering timbers and spine chilling moments while touring about. Fascinating! Jeremy Bentham did her one better, though, didn’t he? Is that there Sarah Hare? No, but her hair is there! How she’s not waxing lyrical. Thanks – too good not to have some fun with! I find this a fascinating way to preserve a likeness at a time when paintings didn’t always capture the essence of a person and photography didn’t yet exist. Almost makes me wish I could’ve known her, as she must’ve been quite a pill. Macaulay has thoroughly enjoyed his time away. He went everywhere with us because as you will know very well, Norfolk is a dog’s county. There are very few places a dog cannot go, including into the boat to go seal watching! What on earth possessed her…? If I was a fiction writer, Kate, you’d be one of my chief sources of spark! Ha! Thanks, Amy 😀 Truth is undoubtably stranger than fiction. When Nelson was killed and buried in St Paul’s, Westminster Abbey lost revenue from visitors who went to St Paul’s instead to see the tomb of the naval hero. However, the abbey had a waxwork of him made as a counter attraction in 1806. What a wonderful country you live in! Cool story Kate. It sounds like hygiene in 1744 had a long way to go if you could buy your rainbow simply from pricking your finger. It does seem a little excessive, doesn’t it, Virginia? Dangeous time, history. Wow, would certainly prove to be a conversation-starter if things got a little dry at teatime. Enjoy your trip, I look forward to the stories you’ll bring back. Thanks Cindy – it is an incredible place. Beyond my wildest expectations, really. The odd things people die from. Yes. It was strange, wasn’t it? 😀 Laughing out loud,here, IE. She does look very familiar, doesn’t she? A bit Hyacinth Bucket. Once again, your provide a fascinating tidbit. I’d never heard of this before. Any idea of any of the really old Roman waxes survived – very fascinating. Thanks for sharing, and have an awesome week.